Urban Vows: Oh! I always wanted to be a wedding planner! Every wedding is so unique to me, each couple and their personalities, what is important to them and what they could not care less about. Their ideas, colours, themes and details all are so intriguing to me. I chose Deb and Barrett's wedding to showcase what exactly being a wedding planner entails, as all so often people tell me they are envious of the job, which I love! But...and yes, there is always a but, it has it's pitfalls as well. Things such as time away from your family and friends, being hired for a friends wedding and no longer being able to enjoy yourself as a guest, and then there are the lists and countless details, the sleepless nights that you worry about something, or, completely the opposite, you are so excited about an idea you cannot turn your brain off. 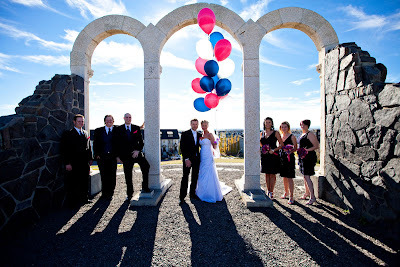 Deb and Barrett's wedding was created in a very short time span, less than five months and therefore the wedding checklist was expedited and we packed a lot into each day. First things first, the venue. Most venues are booked at least a year in advance, sometimes two, depending on the popularity and location of it. Finding a venue that was still available in October was a daunting task indeed. At least 50 different venues were called and emailed, from hotels, to community halls, golf clubs to restaurants. The large majority of these were booked, and outright laughed at me thinking I could squeak in a wedding in a few months. The one's that weren't did not fit the criteria, too expensive, too low a capacity, not the right "feel" and the list goes on. Finally, one day, a miracle occurred and the Siraia Restaurant at Sirocco Golf Club was available! We made a meeting out at the gorgeous country club, with stunning views of a golden valley and we were sold. We snapped a few quick pictures while we were there to use on their invitations. Next, the invitations. I made these using the photo's we took at Sirocco on Wedding Paper Diva's. They are actually on a save-the-date template, so you are only able to add minimal detail, but then we added the website, which I created on mywedding.com where guests could RSVP, book hotels, add well wishes, see the registry and be introduced to the bridal party. This is a great alternative, as the invitations themselves are under two dollars and you save paper and postage by completely avoiding the RSVP cards. The next few months were filled with dress fittings, meetings with the couple, calls and emails to florists, creating a cardbox, making the table numbers, numerous trips to Dollarama and booking a photographer, Chelsea from Shutterbird Photography. 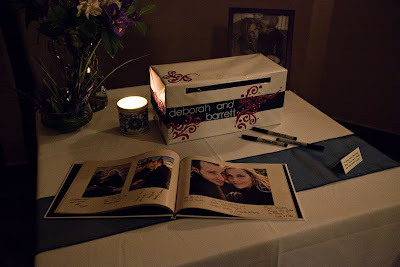 After Deb and Barrett had Chelsea do their engagement photo's, I used them to make a stunning, hard cover guest book that was used for the wedding guests to sign in their best wishes to the couple - such a great alternative to the traditional guestbook. Then there was the stagette - it was a "Hockey Bunnies and their Players" themed jack and jill party. Most of us know one another through hockey, and the couple even got engaged in an arena so we thought it really suited them. The girls went out to pole-dancing class and Melrose while the boys played hockey and golf and we all met up for a BBQ later on that night. This is a great alternative to all the debauchery that often comes with stags and stagette's. Deb in her Mrs. Hemsing Canucks shirt and veil! A wedding planner sandwich! And yes, Barrett is wearing 7 year old girls pajamas. Ash enjoying one of Melrose's famous fishbowls! To cut on costs, I ordered flowers online to create the centerpieces and a few accent bouquets for the guestbook table and the throw-away bouquet. This was a huge amount of manual labor, organizing the timing of deliveries, and riving buckets of flowers to my house. There is also major risk involved in this, as I wanted a particular look to the room and that was fully opened roses, so I received the roses, irises and alstromeria to be delivered two days ahead. My kitchen and dining room looked like a hurricane had ripped through a flower bed. All together these flowers cost less than $300, so yes saved money but the labor involved was intense. After cutting, arranging and putting back in rubbermaids with water, and popping them in my car they were ready for the golf course the next day, again, several trips of huge buckets full of flowers and water. Good news? The flowers were STUNNING. They opened into these huge bright pink blooms. The throwaway bouquet - hey, I never claimed I was a florist! Right before the wedding, usually one or two days in advance I attend the rehearsal. I don't usually get involved at this point, but am there to support the bride and groom and ensure they are comfortable with everything, meet the family and the bridal party and just become familiar with the program of the wedding day. Deb and Barrett must be professionals - they seem a bit bored at the rehearsal, ha ha! The morning of the wedding day involved driving back and forth to the golf course 3 times, partially setting up the room, racing back to the city to get my own family ready for the wedding, and pick up a huge balloon bouquet of navy and fuchsia balloons for the photo shoot after the ceremony. After the ceremony I race back out to the golf course to finish the room for a few hours, and just as guests arrive I am lighting the candles. The room looked better than I could have imagined it, and from the look on Deb and Barrett's faces, I knew they felt the same. Once that initial grand entrance occurs, for the most part, I am off duty, unless I am hired for tear down as well. It is an exhausting 12+ hour day, with little time to stop and breath, think, eat or drink, and my limbs hurt for days after a big wedding, but...and yes...there is always a but...I LOVE my job. I love the smiles on the happy couples faces, knowing they are calm, and relaxed and enjoying their day because they don't have a thing to worry about. The details are something that I thrive on, and seeing a room transform into something you've only imagined in your head is magical. If you want to be a wedding planner, my advice is to work a few as an intern, either with myself or any other wedding coordinating companies in your area. We are a warm and welcoming industry and very supportive of one another. If this is something you dream of doing and even though I have shown you a small glimpse of the "real" work involved and you're still intrigued, you might just be a perfect fit in this crazy fun industry!